Practice Ignition allows you to update/amend your proposals but it is important to know that the things you can change depends on which stage the proposal is in. There are certain limitations to editing proposals that have been accepted by the client due to the fact that they have already agreed to what's already in place. You can edit a proposal whether it's drafted, in review or awaiting acceptance, by selecting the proposal and clicking the Edit Proposal button. This will open the proposal again so you can edit any part of the proposal including adding jobs and services. Remember to click the Save Proposal button in the top right hand corner when you have finished editing. Note: After clicking 'Edit Proposal' on Awaiting Acceptance proposals, you will be prompted if you want to 'Revoke & Edit'. The logic behind this is you're taking back what you've already sent for further changes. 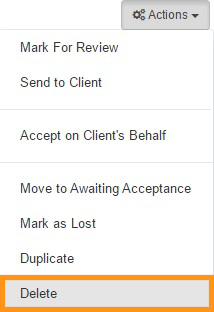 After editing a sent proposal, you will see a new option under 'Actions' called 'Move to Awaiting Acceptance'. This allows you to update the proposal state to 'Awaiting Acceptance' without having to actually send it to the client again. Once a proposal has been accepted, you can still edit the proposal by clicking Adjust Proposal. This allows you to add new jobs and services, but there are certain things you won't be able to change - the start date of the proposals, any invoices that have already been created, and any upfront jobs that have been created. If services are changed or updated, the invoices pushed to Xero will also be updated. If you edit any of the existing jobs, any new job templates will be updated to the job in Workflow max, but the existing job templates will remain unless you manually delete them. Practice Ignition will keep an archived version of all previous versions of the proposal which you can view but not edit so that you will always have an audit trail of what was changed. For more information, see our article on Editing an Active Proposal. You can also mark a proposal as 'Lost' to close it off if the client declines. 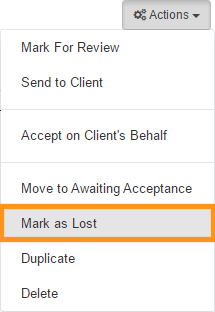 Simply click into the proposal, and select 'Mark as Lost' from the Actions drop down menu. If you have sent a proposal to a client but wish to revoke the proposal, simply go to Actions and select 'Revoke'. You will only be able to choose this on proposals that have already been sent. Once 'Revoke' is selected, the proposal will be reverted back to a draft, and the 'Client Accept Page' will no longer be active. This means that your client will no longer be able to see any of the proposal details through the link until you have re-sent the proposal to them. You can also delete the engagement at any time by selecting 'Delete' from the Actions menu. For help with creating Jobs or Services, see our article on Creating a New Proposal.